The thin black top conductive layer is the layer that your body makes contact with. It is made of PU (Polyurethane) leather. Leather look-alike items made with polyurethane (PU) are very consumer friendly and safe unlike older PVC leathers. Our PU Leather is vinyl free, and platelet free. The thin black layer of PU leather is infused with carbon. Carbon is the 2nd most abundant element in the human body after oxygen. The carbon is what conducts the earths energy. It also makes the leather flame resistant naturally without the use of harsh flame resistant chemicals. 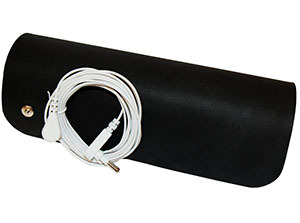 The PU Leather would not be conductive without the addition of carbon. Although it is unlikely that you will be hit by lightning, it is recommended to follow standard lightning safety guidelines as directed by the Environment Canada. Disconnect your Earthing devices during lightning and thunderstorms. Earthing (grounding) refers to the process of establishing conductive contact between the surface of the earth and the the body to maintain the body at earth potential. This occurs naturally when standing barefoot on the earth. Earthing is safe and natural for people of all ages, but it is not medicine or a substitute for medical treatment. If you have a medical condition, see your physician or healthcare provider. If you are using Earthing products and taking medications and notice a change in your condition, even if your condition improves, please consult your doctor. Research has demonstrated that earthing the body plays a substantial role in the reduction of inflammation and functioning of other physiological processes. On this basis, it is strongly recommended that individuals taking medication to thin the blood, regulate blood sugar, control blood pressure, or to regulate hormone thyroid levels, consult their Doctor for advice and a medication monitoring routine before they begin using grounding products, especially sleeping earthed. Other research studies are posted here.